In complete contrast to yesterday's featured picture of the lush green pastures and vales around Grasmere in the English Lake District, we return once more to the arid red rocks of south west Utah. Here the land is, perhaps, less parched than most years at this season; a few passing thunderstorms over the last couple of weeks have dropped some much needed rain. 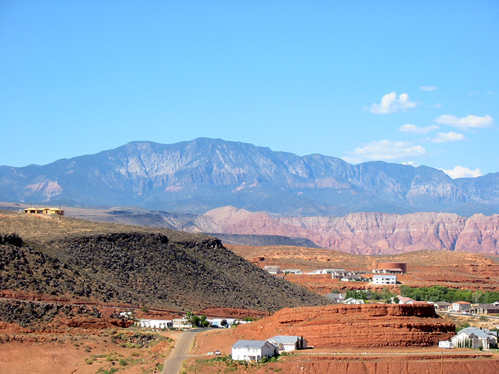 Washington City lies to the north east (on the right hand side of both pictures) of the City of St. George, the two separated by an imposing ridge of the local red rock. Both towns are expanding at a fast rate. The builders of Interstate I-15 boldly cut through the ridge, making a cutting big enough to carry the local inter city roads along either side of the major artery, and more work is presently in progress. To the east of I-15 the top of the ridge has now been developed as a residential community, with a lofty stance from which it is possible to view both urban areas, and observe the cars scurrying about like mechanized ants. Today's picture looks north west from that hilltop vantage point, towards the Pine Valley Mountain range. In the foreground is a weathered sandstone dome, with the city-separating ridge running off into the distance. We have yet to ascertain the reason for the earthworks on the ridge beside the Interstate, and will try to discover this as the job progresses. American sportsman (1971- ). A junior prodigy, in 1988 at 16 years of age he turned professional. Two years later he ranked in the world's top ten, and in 1990 he triumphed over some of the great names in his sport to become the youngest player ever to win one of the most prestigious titles, just 28 days after his 19th birthday. He is quoted as saying, "I never wanted to be the great guy, or the colorful guy, or the interesting guy: I wanted to be the guy who won titles." He had won $41,394,315 in his professional career by May 2001. Later that same year this record seven times winner, with hopes to beat another record of five wins in a row at the world's top venue, was thwarted. However, his name dominates the roll of honor in that event. If you believe sport is not just about statistics, but also involves passion and soul, then you may enjoy Alix Ramsay's assessment of our subject's achievements. NOAA (National Oceanic & Atmospheric Administration) have put online, and into the public domain, over 20,000 images. 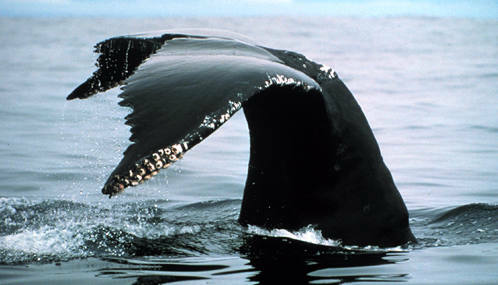 This one, entitled Humpback Tail is also available at that link as a high resolution file. Attribution: Image ID: sanc0114, Sanctuary Collection, Location: Gulf of the Farallones National Marine Sanctuary, Photographer: Ken Balcomb. For users of larger monitors there is a bigger picture available here, but please allow for slower download. In August the Earth enters the orbit of the Comet Swift-Tuttle, which then showers our planet with tiny debris. As the particles enter our gravitational field they heat up from friction with the atmosphere, and produce light tracks in the night sky. Since 1995 Robert Nemiroff & Jerry Bonnell have authored and edited APOD (Astronomy Picture of the Day). Their update for 11 August 2002 has a full size version of this thumbnail image, with links to web pages containing background information on the meteor showers, including details of how and when they are best observed. ...when I presented it to my Ph.D. committee, they said, "Nope. It's too tongue in cheek and it isn't scholarly enough." My real dissertation is called, 'Scale, Landscape Structure and Suburban Habitats: How Do We Affect Avian Communities?' I don't think it'll be as big a seller as, 'That Gunk on Your Car'. Author Mark Hostetler spent years scraping bugs off windshields, and photographing the grisly microminiature exoskeletal remains. The result is a book, 'That Gunk on Your Car: A Unique Guide to Insects in The United States'. You may read an interview with him on Car Talk, the web site of one of the most entertaining shows on the American wireless networks. The show's affable hosts, 'Click & Clack, The Tappet Brothers' (otherwise known as Tom & Ray Magliozzi), have a bugsplat recognition game on their web site. Mark Hostetler's web page has examples of bugs and their splats along with details about how to obtain the book, which received a 1977 IG Nobel award from the Annals of Improbable Research.